So being inboard I have the choice of stern drive or jet drive... stern drive is just as much as an outboard forget that. So... jet drive... I'm dead set on it. Totally crack on, I'ed use a Ford Zetec 2.0 engine instead of a Rover V8 though, sorted I thought, thats how to do it... Only to find out Hamilton no longer make this jet pump and havent done for 15 years, and trying to find one is impossible. Why does noone make a small simple jet drive like Hamilton used to? Edit: Just found this, http://jjotool.tripod.com/F16Xr/JD_Sport_Jet_175.jpg made by Mercury exstally what I want but a horizontal shaft not vertical and without the engine on top, witch just makes it as costly as an outboard... Even red the specs and thats 120hp AND it goes at 5000/5500rpm not 8000/9000 like a jet ski pump does. What am I missing why can't I find a resonable jet drive that likes 5000rpm 130/150hp just like the Hamilton one, and the bottom part of the mercury one? Many many thanks If anyone can help at all, I'm desperate now. 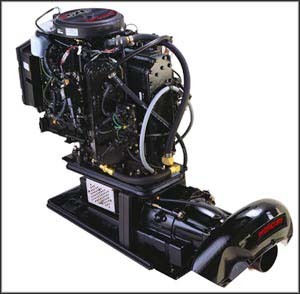 If you are worried about cost, the outboard is cheaper in the long run. Fuel consumption on a jet is very bad. The motor you mentioned....is there a marine conversion for it? Post pic of your boat....oh ya,welcome!!! UK builder Rupert is building a diesel powered jet Mist Miss. He's using a Castoldi water jet from Lancing Marine. Enjoy your project and don't forget to post some photos along the way ! Thanks so much for the replies chaps. Will change location to UK, sorry about that! I'll get some pictures of the boat up soon. At the moment its just been stripped and nearly all sanded down in 240 gritt, back to the orginal gelcoat, going to matt/resin in the many holes in the dashboard and places I don't want, bit of gelcoat and I'll treat this LIKE bodyfiller, finish it in 240. Prime the lot in a non-porous primer, something like Epoxy something or other I guess (I'll have a look at some data sheets at work) flat that down then on with some solvent base and 2k clear. I spray cars for a living, so this part of the project is the easy bit. As for economy... I bet its going to be fairly bad but, I'm hoping by using a 2.0 Zetec it wont be toooo bad, its hard work getting less than say... 18mpg out of this engine in a big saloon car (Ford Mondeo) even with the day lights ragged out of it constantly. I used to have sometime ago now a 100hp Mercury outboard, and it used to drink biiiiig time, the 2.0 zetec has to be at least slightly better. A project such as yours is not to difficult. Go to http://www.nzjetboating.com/ you will find all you need to get going in the projects section. Rover 3.5 v8 engines make one of the best jetboat engines as the power to weight ratio is very good. Here is a jet drive that might do you.